GUANTANAMO BAY NAVAL BASE, Cuba Five Guantanamo prisoners charged in the Sept. 11 attacks returned before a military tribunal Monday, forgoing the protests that turned their last appearance into an unruly 13-hour spectacle. 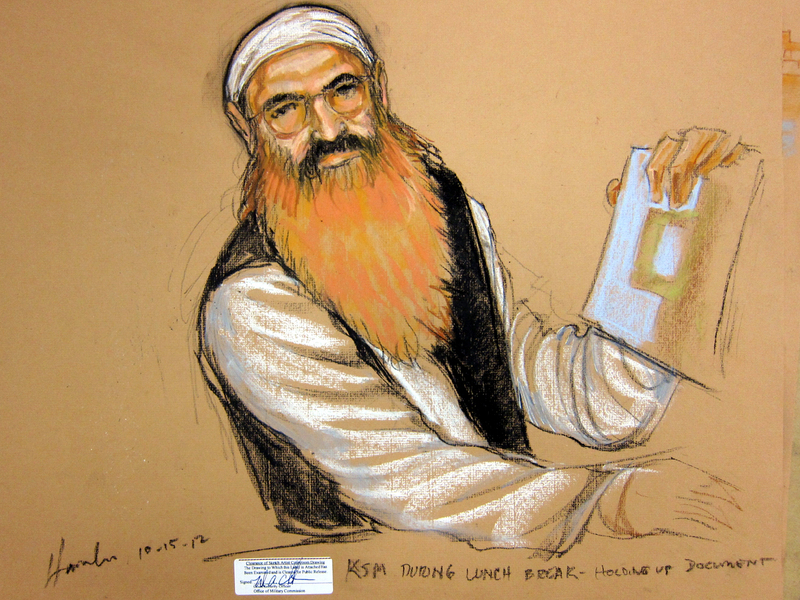 But the apparent cooperation of Khalid Sheikh Mohammed, who has said he masterminded the worst terror attack on U.S. soil, and four codefendants did little to speed up proceedings that have stuck in a legal and political morass for years. And Mohammed, dressed a white turban and traditional black vest, made clear he still feels a deep disdain for the proceedings, saying "I don't think there is any justice in this court." Defense lawyers spent hours arguing that their clients shouldn't have to attend the hearing, saying they dredge up bad memories of their harsh treatment in CIA detention. The military judge ruled that the men would not have to attend the hearings at least for the rest of the week. "Our clients may believe that ... I don't want to be subjected to this procedure that transports me here, brings up memories, brings up emotions of things that happened to me," said Jim Harrington, who represents Ramzi Binalshibh, accused of helping to provide support to the hijackers who crashed planes into the World Trade Center, Pentagon and a field in Pennsylvania on Sept. 11, 2001. The five men sat quietly at the defense tables under the watchful eyes of military guards and several 9/11 family members at the U.S. base in Cuba. Wearing traditional robes, Mohammed, his beard dyed a rust color with henna, serenely read legal papers and listened quietly to the proceedings through headsets. Two others responded politely to the judge when asked. The Sept. 11 victims' family members attending the hearings in Guantanamo are chosen by lottery. Other families and the public were invited to view the proceedings from closed-circuit video in New York, New Jersey, Massachusetts and Maryland. At Guantanamo, five blood relatives of victims were allowed to attend the hearing, and each were allowed to bring a guest. At the Fort Hamilton Army base in Brooklyn, N.Y., the only U.S. location to see any victims' family members, just four attended the first day of the hearings, CBS News reports. Robert Reeg, a retired New York firefighter who was critically injured on 9/11, told reporters it's been "a long ordeal" leading up to the hearings. He said he'd felt "mentally waterboarded" since a 2009 decision to drop earlier military-commission charges. Congress then blocked civilian trials amid opposition to bringing the defendants to U.S. soil. "We're going to persevere," said Reeg. "We want justice." Diane Fairben, mother of Keith Fairben, a 24-year-old paramedic who died from responding to the attacks, said she was happy with the proceedings against the defendants. "They are getting the best defense; they are getting everything and then some, and things are being done right, and we're happy about that," said Fairben, "because we don't want anything to have to come up on appeal that would let these -- I don't even want to say people -- but lets them slip the noose, so to speak." Ken Fairben came with a picture of Keith. As he watched the proceedings, he said he looked into each of the men's faces, wondering, "What is he thinking? Why would he want to do this?" The suspects could be sentenced to death if convicted, but Ken Fairben said he hopes they get life sentences instead. "If you give them death penalties, that's martyrdom to them," he said. "Why give them something they want?" All seemed to cooperate with their attorneys in a specially designed high-tech courtroom that allows the government to muffle sounds so spectators behind a glass wall cannot hear classified information. Harrington told the court that the defendants may want to boycott future court sessions because they don't recognize the U.S. government's authority, or because their transportation from their high-security cells may remind them of the harsh treatment they endured when confined in the CIA's overseas network of secret prisons before they came to Guantanamo in September 2006. Prosecutors want the men to be required to attend court sessions. Army Col. James Pohl ruled that Mohammed and his codefendants would not be forced to attend hearings that were scheduled to run through the end of this week. He said he may require them to attend future pretrial sessions and said they would have to be present for their trial, likely to begin more than a year from now. He questioned each defendant individually to make sure they understood the consequences of choosing not to attend. Mohammed responded with a brusque "yes," in Arabic, almost a grunt, before making his one and only statement of the day about the court and justice. The judge told each man that the trial would go on without them if they were to somehow escape, a notion that prompted a smile of disbelief from Binalshibh. "I'm escaping from custody?" he said in English. The same question prompted some sarcasm from Ali Abd al-Aziz Ali, a Pakistani citizen accused of funneling money to the hijackers. "I'll make sure to leave some notes," he said in English. The U.S. government has acknowledged that before the defendants were taken to Guantanamo in September 2006 they were subjected to "enhanced interrogation techniques" which in some case included the simulated drowning method known as waterboarding. Defense attorneys say the treatment will be used in their defense, but the proposed order limits their ability to make that case in court. Mohammed and his four co-defendants are being prosecuted in a special military tribunal for wartime offenses known as a military commission. They were arraigned May 5 on charges that include terrorism, conspiracy and 2,976 counts of murder in violation of the law of war, one count for each known victim of the Sept. 11 attacks at the time the charges were filed. Mohammed, a Pakistani citizen who grew up in Kuwait and attended college in North Carolina, has told military officials that he planned the Sept. 11 attacks "from A to Z" and was involved in about 30 other terrorist plots. He has said, among other things, that he personally beheaded Wall Street Journal reporter Daniel Pearl. In addition to Ali and Binalshibh, the other defendants are Walid bin Attash; and Mustafa Ahmad al-Hawsawi.